Built by Australian Yacht Builders in 1991 in collaboration with a highly-experienced and visionary owner, FAM boasts generous proportions, sleek lines, huge volumes and high-quality all-aluminum construction. Designed to cruise the world, she is ideally suited to the adventurous at heart. Regular refits throughout her life, including a significant refit from 2014 to 2017, have kept her in beautiful condition. FAM is able to welcome up to 14 guests on board in six staterooms, and carries 13 crew with seven crew cabins. The full beam owner’s stateroom is located in prime position on the forward main deck, with features including his and hers wardrobes, oversized windows that fill the space with natural light, and his and hers ensuites. The ‘hers’ ensuite includes an oversized whirlpool bath and marble shower while ‘his’ has a large shower and gym equipment for a private workout. 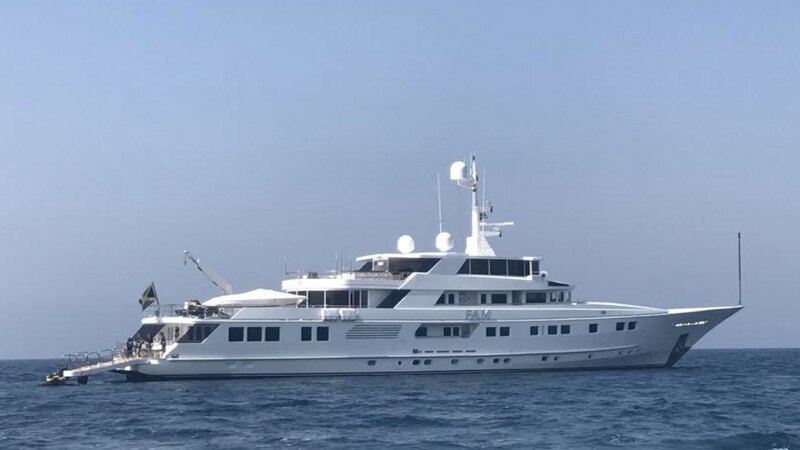 Her accommodation layout is very versatile and the sixth cabin, located forward to starboard on the main deck, is designed for flexible use including as the owner’s study, child or nanny cabin, or an additional guest cabin. Four further guest cabins – three queens and a twin with pullman – are located on the lower deck forward. The forward and aft starboard VIP guest cabins also feature whirlpool baths. All accommodations are beautifully styled and spacious, featuring marble detailing and modern entertainment systems. Interior design is by Paola Smith & Associates and FAM is defined by her impressive spaces, which stand her apart from her peers. A four deck elevator and wheelchair access make her incredibly easy to move around. Guest spaces include the large main salon, which is home to a Steinway and Sons Grand piano, a game table, relaxed seating and dining set up. The sky lounge is a second stylish space for guests to retreat to, which connects to a large al fresco dining table on the aft deck. Ideal for entertaining both indoors and outdoors, FAM has impressive exterior spaces including the huge sundeck which features a bbq, fully equipped bar, large heated waterjet pool and several sunbeds. Another popular space is the bow, home to large sunbeds and two large circular al fresco dining tables. Guests can take their pick from the many different spaces to relax, enjoy al fresco dining, or simply enjoy the sunshine and views.